This is my first attempt at converting an Imperial Guard model. I decided to try my hand at Colonel "Iron Hand" Straken for my first go around. I even converted his shotgun since that's not a bit you can easily find. Don't worry, the tutorial for the shotgun conversion is further down in the post. The whole project came to me in a roundabout way through a series of emails between a reader and myself about painting and how to improve so that you capture the detail on your models. One thing led to another and we ended up talking about his Colonel Straken model he had. I offered to repaint it for him to show him some of the techniques I was talking about instead of trying to explain it all in-depth by email. Here's what his model looked like when he sent it to me. He's got a very dark scheme overall and that's why I thought I might be able to share my techniques since they are similar in the end result... very dark. Looking at his model, there were some things that we covered that would certainly make a difference in his painting overall with making it look more "finished." The first of those has nothing to do with painting the model, but has everything to do with the base. A completed base adds so much more to the model. Tying in with that is making sure you have a clean model as well. By clean, I mean no stray mold lines, excess glue, sloppy greenstuff work and junk like that all over your model. They add unwanted texture and can make it confusing for viewers to understand what it is that they are looking at. When it comes to highlighting (especially line highlighting), you don't have to go extreme with your highlights, but you do need to be clean and crisp with your work. Stray marks and inconsistent thickness (in your highlights) detracts from a model. Considering how much time it takes to line highlight anything, you want to make sure you get the best result there. At first the plan was to strip his model and repaint it. We talked about this and the decision was made to rebuild it as close as I could get while adding my own touches to the conversion. It would make it much easier to start with nice, clean surfaces if I used new bits instead of trying to clean up used ones. I used the same parts for most of my model that were on the original. The shotgun is where I went out on my own. The conversion is not my idea though. I saw it a while ago online and kept the idea in the back of my head if I were ever to do a squad of shotgun toting Space Marine Scouts. I figured it would be absolutely perfect for those guys. You're going to need two arms to pull this one off. A regular Guard lasgun arm and the flamer arm. I used a third arm later on because I wanted to change how he was holding the gun since he had a power sword in his other hand. 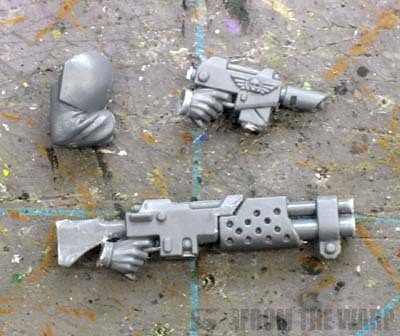 From the flamer, you cut away the muzzle and barrels just in front of the body of the weapon. Cut off the torch on the very front as well. Take this bit, flip it around and glue it onto the front of the lasgun. Try and get a lasgun that does not have the front hand cast into the weapon, it will make it easier in the end as it's one less thing you need to cut away. 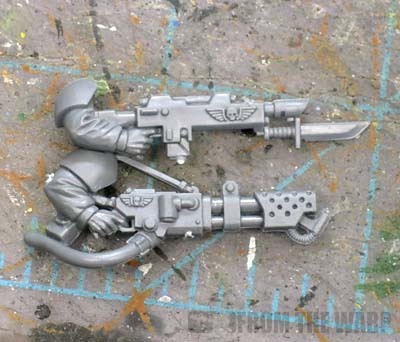 You'll have to trim away the Imperial winged skull on the side of the lasgun and slowly cut away the front of the weapon so you get a nice match between it and the flipped around flamer bit. The angle can be tricky, but easy enough to do if you take your time. Here's where I did some additional work since I wanted him holding the shotgun with one hand and not two. I took the laspistol arm and cut away the pistol. From there, I took my shotgun arm and very carefully carved out the stock of the shotgun from the material there. Then I married up the new arm in the position I wanted along with the converted weapon. It took some additional cutting away of plastic along the inside of his arm to get the two bits to come together nicely, but it worked like a charm. Here's what he looks like prior to any painting. 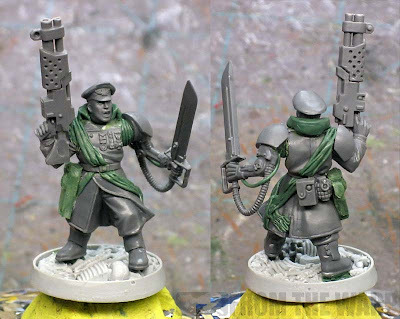 I went in with greenstuff and added a few more elements to the model in order to make him stand out from a regular Cadian Officer. I gave him a sash since I figured I could paint it a contrasting color and I raised his collar to make it look like he was wearing more of a heavy duty coat. I added a holster to his hip and gave him a few things like grenades and a pouch to help bulk him out a little bit more. I ended up setting him on a Bone Fields base from Secret Weapon minis. It was the perfect fit for the theme my friend already had going on so that was no-brainer for me. I also opened up his pose a little bit by repositioning his bionic arm. It meant I had to resculpt the shoulder connection and add some flex fitting in there, but I think it helps the pose overall. Next time we visit this guy, he'll be painted up and I'll show you what I did to give him a dark scheme overall. This is a great conversion - you can easily recognize where the bits come from, yet there's more to it than meets the eye. The shotgun looks badass! Wow! That's a novel and exceedingly simple approach (that I of course never would have thought of) for a shotgun! I am now in even more awe of your skills with the stuff. That shotgun conversion is another classic "why didn't I think of that?" conversion I've found this site invaluable for. Thanks for all the great tips and keep up the great work! Thanks folks! I like the shotgun most of all myself. I think it would look great in the hands of some Space marine scouts or Adeptus Arbite conversions. I can't take credit for it though. I just used it here and am sharing it with all you guys. rob82: That's how it works... start off small and work up from there. In no time at all, you'll be doing the same kind of work. And your addition of that little bit of greenstuff is perfect. Just enough to blend the conversion and create the illusion. That's all you need. Thats incredible work with the shotgun conversion. Great work as always! While the shotgun might not have been your idea, your execution is brilliant. Looks great! It's pretty big, fitting for a named character to be toting, and I agree that it would work well for SM scouts. Nice GS work all around, I think the addition of the collar is actually very important/has a big impact on the model. Not just more heavy duty, but more important, like what we're used to seeing on commissars. Great work! Very nice! The bits all come together beautifully, it's got a real dynamic feel to it. Awesome work! The shotgun is solid- simple yet awesome! Having seen this bad boy in person, I can vouch for the awesomeness of this model, and that shotgun had me going home and cutting up flamers the night I first seen it. 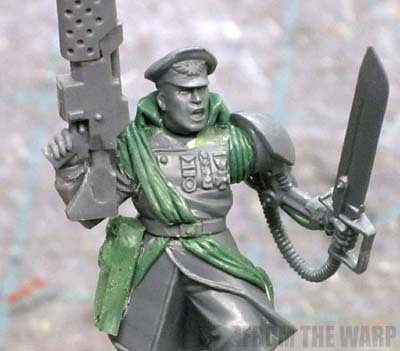 40K Giveaway: The collar is a bit rough in retrospect. It was one of my first attempts. 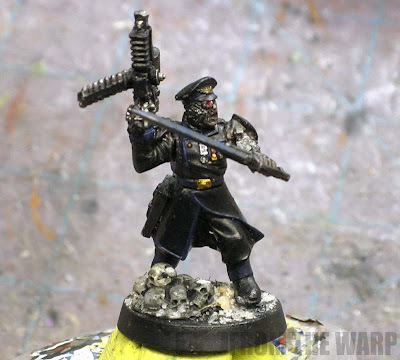 I've since taken to adding the feature to the Death Korps squad I started before my studio was wrecked and have made some improvements to them. Grizzly Adams: So you've seen the finished model then. Glad to hear you like how it turned out. I'll be posting the final pics once I can get them uploaded onto the computer. I struggled with the various types of "black" on the model, but I think I was able to pull it off in the end. That shotgun work is genius! and the arm ain't too shabby either. awesome work! Looks fantastic, may need to steal the shotgun idea for my vets..
Also I like the change of Straken to a Cadian look opposed to the Catachan look. Brinks and TheTrans: Thanks guys! I love this conversion! Simple but looks fantastic. Irinyir: Thanks. I like to think I kept him simple because that was the big master plan, but he just sort of happened that way. All I did was try to work from what my friend gave me originally. Thanks Admiral. Converting and painting up some Guard models has made for a really nice break from all the power armour I do. Have to say, one of the best Straken conversion I have ever seen! Kevin: Thanks. I don't know about him being the best one, but I appreciate the kind words.